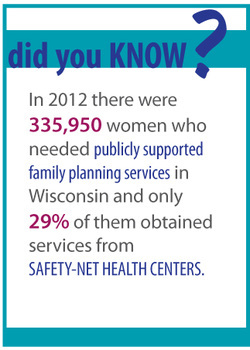 A part of BadgerCare, FPOS provides certain family-planning services to Wisconsin men and women starting at age 15. FPOS focuses on preventing unwanted pregnancies. Services covered by FPOS include: contraception (birth control, condoms, etc. ), natural family planning supplies, family planning pharmacy visits, pap tests, testing and treatment for STIs/STDs, routine and preventive primary services related to family planning, and tubal ligation for women or voluntary sterilization for men ages 21 and older. Men and women of reproductive age who are not enrolled in BadgerCare Plus or Wisconsin Medicaid, and whose family’s income does not exceed 300% of the Federal Poverty Level are eligible for FPOS. The Legislative Fiscal Bureau estimates that the average monthly enrollment for the FPOS program will remain around 46,000 people for 2015-2017. The 2013-2015 budget decreased funding for the Family Planning Only Services (FPOS) program to $19,260,000 for the biennium. This decrease in funding reflected an assumed 91.3% drop in the program’s enrollment from 2013 to 2014. This drop in participation was based on the assumption that most FPOS enrollees would purchase health coverage in the Health Insurance Marketplace and would no longer need to rely on FPOS services. According to the Legislative Fiscal Bureau, FPOS enrollment only decreased by 33% between 2012 and 2015. This means that there was not adequate funding to ensure adequate access to family planning services for all program enrollees. The proposed budget increases funding for Family Planning Only Services to accommodate the previous budget’s over-assumption in the drop of FPOS enrollment. The 2015-2017 proposed budget would fund the FPOS program at $31,000,000 for the biennium. The Legislature approved the Governor's proposed 2015-2017 FPOS budget in its entirety. The reinvestment in the FPOS program is necessary as about 46,000 individuals per month continue to rely on the program for family planning services and health care. In 2012, 335,950 Wisconsin women needed publicly supported family planning services, a large proportion of which were young, women of color, low-income, and/or uninsured (see this chart). Only 29% of these women were able to obtain family planning services through publicly funded, safety-net health centers. Access to publicly supported family planning, like the FPOS program, is critical for women who may otherwise slip through the cracks of the U.S. health care system, particularly as women continue to enroll in insurance programs through the Health Insurance Marketplace. Life events such as job loss or change, relationship changes, graduating from an institution of higher education, and more, are all points of insurance instability during which it is particularly important to ensure women get their basic reproductive health needs met. As such, it is essential that the FPOS program is adequately funded to ensure family planning and contraceptive continuity, especially among low-income women.